Make Central Europe more innovative and competitive by improving the innovation potential of small and medium-sized urban ecosystems - this is the goal of the EU project URBAN INNO. Regional pilot projects are intended to involve citizens in urban innovation processes; emphasis lies on mobility, energy, innovative management, agriculture, integrated infrastructure and medium-sized economic growth. The result of the project will be published and made available in several languages ​​free of charge in a virtual online “tool kit“ including methods for public participation in innovation processes. "Sustainable Two-Wheel City Karlsruhe 2025+"
E-bikes and pedelecs: Where are they used in Karlsruhe, what about the local infrastructure and where is still need for improvement? On September 16, citizens of the eDrais2017 pilot project met with experts at a so-called future workshop. It was all about the subject of "eBikes & Energy": On the occasion of the 200th anniversary of the bicycle jubilee, the focus was on the infrastructure and the use of eBikes and pedelecs in Karlsruhe. Together, the participants developed a vision on "Sustainable Two-Cycle City Karlsruhe 2025+". Particular attention was paid to the participation of citizens in the development of local infrastructures for eBikes and their energy awareness. eDrais2017 is not only one of the URBAN INNO pilot projects, but has also been embedded in the launching European Mobility Week, where 50 countries around the world have dealt with issues related to clean, shared and intelligent mobility. As a result of mobility needs, but also with regard to the use of eBikes and pedelecs, a targeted ideal state for the use of electrically operated or supported two-wheelers in the near future was developed. Also the path from the "actual" to the "target" was discussed using new technologies. 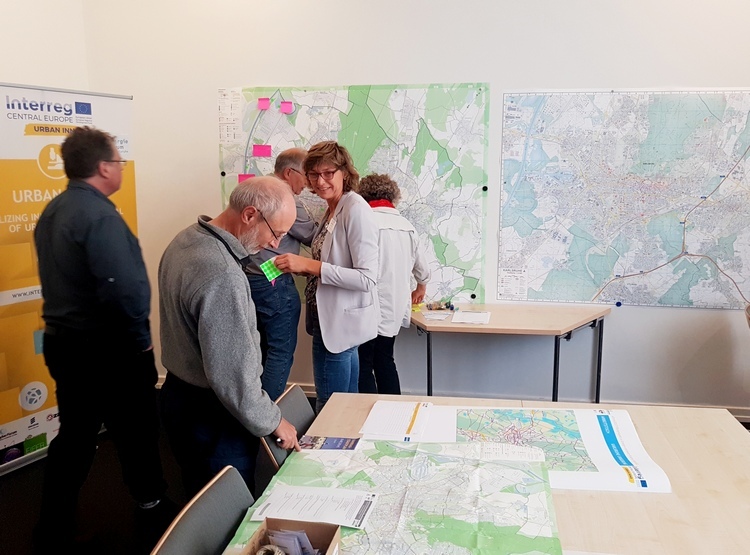 The results of the event are now being examined, prepared and made available to the city planning office as well as to the EnergieForum and the business development Karlsruhe for further use.